FREQUENTLY ASKED QUESTIONS WE RECEIVE ABOUT LYME DISEASE. Educate yourself on Lyme Literate doctors and TREATMENT…. And JOIN OUR FIGHT AGAINST LYME! Called the “Great Imitator,” Lyme disease can mimic hundreds of other conditions since its symptoms mirror many medical problems such as multiple sclerosis, arthritis, chronic fatigue syndrome or lupus. Symptoms of Lyme and other tick-borne diseases may come and go and may be subtle or pronounced. The hallmark bull’s-eye rash, or erythema migrans (EM) rash, which appears at the site of the tick bite, is absent in half of the diagnosed cases. Click HERE to learn more. Practicing good tick bite prevention habits is the best way to prevent Lyme and other tick-borne diseases. Good habits range from what clothing you wear, where you walk, and how often you check for ticks. Simply, it’s important to Be Tick AWARE. Everyone’s journey with Lyme disease is different, and that is why it is so important to see an ILADS educated Lyme expert. These are medical professionals who have been specifically trained by ILADS about Lyme and associated diseases. Their efforts to increase the level of understanding and expertise about Lyme and associated diseases within the medical community are in service of a larger goal – to improve care for patients with tick-borne infections. Click HERE for ILADS provider search. It often may take multiple calls, e-mails, doctors visits and different treatments to find what you feel may be the best path for you. We hope that you will not get discouraged along the way, even though it may be quite frustrating and exhausting. There is always HOPE & you are never alone. FUNDING FOR TREATMENT OUTSIDE OF THE US: Funds raised via our #HeadAboveWater initiative will be allocated to creating an international grant program, to be administered by our partner beneficiaries. When the international program is ready to launch, we will share eligibility criteria and additional information widely via our social media channels. To help us reach this goal faster, please click the #HeadAboveWater graphic of Avril (to the right). Your support on our journey to serve as many individuals affected by Lyme as we possibly can is much appreciated. Thank you for joining us in this fight! Given the advances made by modern medicine, it is remarkable that there is neither a reliable diagnostic test for Lyme disease, nor an effective treatment for long-term Lyme. GLOBAL LYME ALLIANCE (GLA) is dedicated to accelerating the development of more effective methods of diagnosis and treatment of Lyme and other tick-borne diseases. 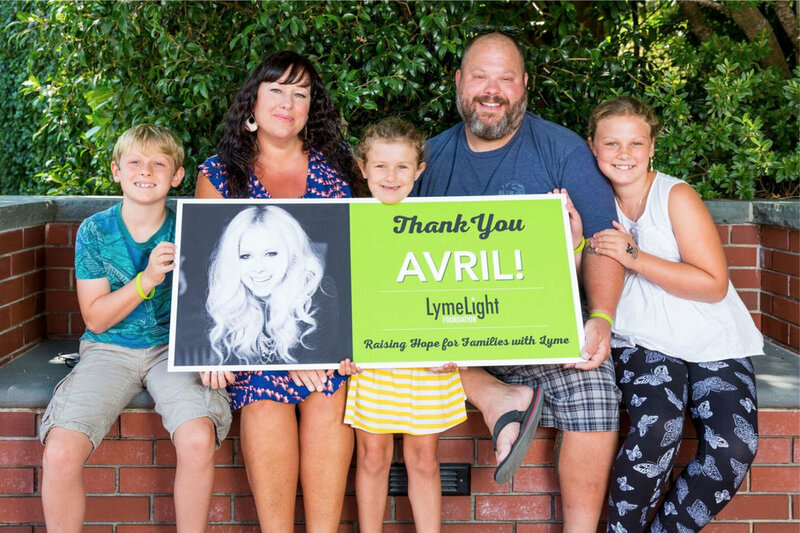 The Avril Lavigne Foundation has recently partnered with Global Lyme Alliance (GLA) to help further their commitment to filling this gap by funding innovative and promising research that leads to the development of an accurate and accessible diagnostic test, treatments for long-term, or persistent, Lyme, and a cure.